Nestlé Offered Permit To Continue Taking Water From California Watershed The company's U.S. bottled water unit had been found to be operating under a long-expired permit, taking tens of millions of gallons a year from a watershed in the San Bernardino National Forest. 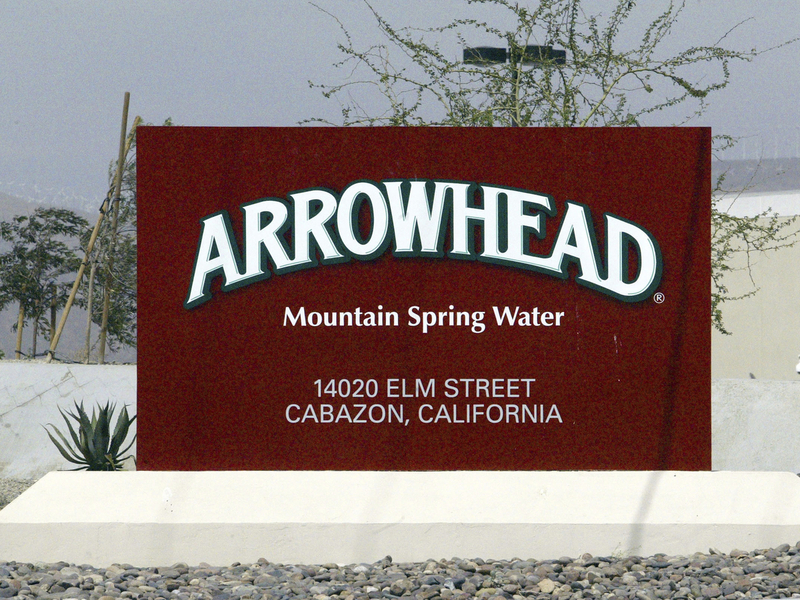 In a file photo from 2004, a sign at the entrance to the Arrowhead Mountain Spring Water Company bottling plant, owned by Swiss conglomerate Nestlé, on the Morongo Indian Reservation near Cabazon, Calif. The U.S. Forest Service has offered Nestlé a three-year permit to continue drawing millions of gallons of water from the San Bernardino National Forest. Under the offer, Nestlé Waters North America — the largest bottled-water company in the country — will be allowed to keep taking water from the Strawberry Creek watershed. That watershed is currently rated as "impaired" and the extraction is to be allowed "when there is water available consistent with the forest's Land Management Plan," according to The Associated Press, citing the offer. Nestlé, which bottles the water under its Arrowhead brand, has 60 days to decide whether to accept the terms of the offer, the AP says. As NPR's Bill Chappell reported in December, Nestlé, a division of the Swiss food company, says it took an average of 62.6 million gallons of water from the San Bernardino spring each year from 1947 to 2015, but a two-year investigation by California's State Water Board found that it lacked legal permits for much of that water. "The Water Board began investigating after several complaints were made against Nestlé during California's recent drought. Spurred by a 2015 report in the Desert Sun newspaper, the allegations against Nestlé ranged from accusation that the giant company lacked full rights to the water it was selling to claims that its actions were harming the natural environment and its inhabitants," Bill reported last year. According to the Desert Sun, Nestlé had been operating under a permit issued to the Arrowhead Puritas Waters Inc. in 1988. Arrowhead Puritas was acquired by Nestlé in 1992. "The revelation that officials had allowed the company to use the permit without a review for 27 years generated an outpouring of opposition and prompted the permit review, as well as a lawsuit by environmental groups and an investigation by California regulators," the newspaper reports. In a statement on Wednesday, Nestlé said it had provided 70 environmental studies during the application process and that it would "carefully review" the Forest Service offer. "Californians are passionate about water and so are we," the company said. "We take our responsibility as a California water steward seriously and Arrowhead's successful operations for more than a century point to our commitment to long-term sustainability." Nestlé's opponents say the company has depleted the spring-fed Strawberry Creek, having an adverse effect on the wildlife that the waterway supports. They have called for the company's tap to be turned off. "Water from Arrowhead Springs was first bottled for sale more than a century ago. It's named after the famed arrowhead-shaped natural rock formation on a mountainside north of San Bernardino and the springs near it — both hot and cold. The hot springs were once the central attraction of a glamorous resort, which closed in the late 1950s and now stands vacant at the base of the San Bernardino Mountains. The wells and water pipelines on the mountainside have been authorized under various permits since 1929. Forest Service officials have said Nestlé's most recent 1978 permit, which was issued to predecessor Arrowhead Puritas Waters Inc., remained in effect while they reviewed the company's renewal application."